Apache Lucene is a high-performance, full-featured text search engine written entirely in Java. GraphDB supports FTS capabilities using Lucene with a variety of indexing options and the ability to simultaneously use multiple, differently configured indices in the same query. Full-text search (FTS) concerns retrieving text documents out of a large collection by keywords or, more generally, by tokens (represented as sequences of characters). Formally, the query represents an unordered set of tokens and the result is a set of documents, relevant to the query. In a simple FTS implementation, relevance is Boolean: a document is either relevant to the query, if it contains all the query tokens, or not. More advanced FTS implementations deal with a degree of relevance of the document to the query, usually judged on some sort of measure of the frequency of appearance of each of the tokens in the document, normalised, versus the frequency of their appearance in the entire document collection. Such implementations return an ordered list of documents, where the most relevant documents come first. FTS and structured queries, like these in database management systems (DBMS), are different information access methods based on a different query syntax and semantics, where the results are also displayed in a different form. FTS systems and databases usually require different types of indices, too. The ability to combine these two types of information access methods is very useful for a wide range of applications. Many relational DBMS support some sort of FTS (which is integrated in the SQL syntax) and maintain additional indices that allow efficient evaluation of FTS constraints. Typically, a relational DBMS allows you to define a query, which requires specific tokens to appear in a specific column of a specific table. In SPARQL, there is no standard way for the specification of FTS constraints. In general, there is neither a well-defined nor commonly accepted concept for FTS in RDF data. Nevertheless, some semantic repository vendors offer some sort of FTS in their engines. The GraphDB FTS implementation, called ‘RDF Search’, is based on Lucene. It enables GraphDB to perform complex queries against character data, which significantly speeds up the query process. RDF Search allows for efficient extraction of RDF resources from huge datasets, where ordering of the results by relevance is crucial. Implementation - The Lucene engine is integrated and used for indexing and search. In order to use the FTS in GraphDB, first a Lucene index must be computed. Before it is created, each index can be parametrised in a number of ways, using SPARQL ‘control’ updates. In order to use the indexing behaviour of Lucene, a text document must be created for each node in the RDF graph to be indexed. This text document is called an ‘RDF molecule’ and is made up of other nodes reachable via the predicates that connect the nodes to each other. Once a molecule has been created for each node, Lucene generates an index over these molecules. During search (query answering), Lucene identifies the matching molecules and GraphDB uses the associated nodes as variables substitutions, when evaluating the enclosing SPARQL query. The scope of an RDF molecule includes the starting node and its neighbouring nodes, which are reachable via the specified number of predicate arcs. For each Lucene index, it can be specified what type of nodes are indexed and what type of nodes are included in the molecule. Furthermore, the size of the molecule can be controlled by specifying the number of allowed traversals of predicate arcs starting from the molecule centre (the node being indexed). Blank nodes are never included in the molecule. If a blank node is encountered, the search is extended via any predicate to the next nearest entity and so on. Therefore, even when the molecule size is 1, entities reachable via several intermediate predicates can still be included in the molecule if all the intermediate entities are blank nodes. Description: Provides a regular expression to identify nodes, which will be excluded from the molecule. Note that for literals and URI local names the regular expression is case-sensitive. The example given below will cause matching URIs (e.g., <http://example.com/uri#helloWorld>) and literals (e.g., "hello world!") not to be included. Description: A comma/semi-colon/white-space separated list of entities that will NOT be included in an RDF molecule. The example below includes any URI in a molecule, except the two listed. Description: A comma/semi-colon/white-space separated list of properties that will NOT be traversed in order to build an RDF molecule. The example below prevents any entities being added to an RDF molecule, if they can only be reached via the two given properties. Description: Indicates what kinds of nodes are to be included in the molecule. The value can be a list of values from: URI, literal, centre (the plural forms are also allowed: URIs, literals, centres). The value of centre causes the node for which the molecule is built to be added to the molecule (provided it is not a blank node). This can be useful, for example, when indexing URI nodes with molecules that contain only literals, but the local part of the URI should also be searchable. Description: A comma/semi-colon/white-space separated list of entities that can be included in an RDF molecule. Any other entities are ignored. The example below builds molecules that only contain the two entities. Description: A comma/semi-colon/white-space separated list of properties that can be traversed in order to build an RDF molecule. The example below allows any entities to be added to an RDF molecule, but only if they can be reached via the two given properties. Description: Indicates what kinds of nodes are to be indexed. The value can be a list of values from: URI, literal, bnode (the plural forms are also allowed: URIs, literals, bnodes). Description: A comma separated list of language tags. Only literals with the indicated language tags are included in the index. To include literals that have no language tag, use the special value none. Description: Sets the size of the molecule associated with each entity. A value of zero indicates that only the entity itself should be indexed. A value of 1 indicates that the molecule will contain all entities reachable by a single ‘hop’ via any predicate (predicates not included in the molecule). Note that blank nodes are never included in the molecule. If a blank node is encountered, the search is extended via any predicate to the next nearest entity and so on. Therefore, even when the molecule size is 1, entities reachable via several intermediate predicates can still be included in the molecule, if all the intermediate entities are blank nodes. Molecule sizes of 2 and more are allowed, but with large datasets it can take a very long time to create the index. Description: Indicates whether the RDF weights (if they have been already computed) associated with each entity should be used as boosting factors when computing the relevance of a given Lucene query. Allowable values are no, yes and squared. The last value indicates that the square of the RDF Rank value is to be used. Description: Sets an alternative analyser for processing text to produce terms to index. By default, this parameter has no value and the default analyser used is: org.apache.lucene.analysis.standard.StandardAnalyzer An alternative analyser must be derived from: org.apache.lucene.analysis.Analyzer. To use an alternative analyser, use this parameter to identify the name of a Java factory class that can instantiate it. The factory class must be available on the Java virtual machine’s classpath and must implement this interface: com.ontotext.trree.plugin.lucene.AnalyzerFactory. Detailed example: In this example, we create two Java classes (Analyzer and Factory) and then create a Lucene index, using the custom analyser. This custom analyser filters the accents (diacritics), so a search for “Beyonce” finds labels “Beyoncé”. Put the .jar file in the plugins folder (specified by -Dregister-external-plugins=..., which by default is under <TOMCAT-WEBAPPS>/graphdb-server/WEB-INF/classes/plugins). There has to be some data in the repository. Put the .jar file in the plugins folder (specified by -Dregister-external-plugins=..., which by default is under <TOMCAT-WEBAPPS>grapgdb-workbench/WEB-INF/classes/plugins. Description: Sets an alternative scorer that provides boosting values, which adjust the relevance (and hence the ordering) of results to a Lucene query. By default, this parameter has no value and no additional scoring takes place, however, if the useRDFRank parameter is set to true, then the RDF Rank scores are used. An alternative scorer must implement this interface: com.ontotext.trree.plugin.lucene.Scorer. In order to use an alternative scorer, use this parameter to identify the name of a Java factory class that can instantiate it. The factory class must be available on the Java virtual machine’s classpath and must implement this interface: com.ontotext.trree.plugin.lucene.ScorerFactory. Creating an index can take some time, although usually no more than a few minutes when the molecule size is 1 or less. During this process, for each node in the repository, its surrounding molecule is computed. Then, each such molecule is converted into a single string document (by concatenating the textual representation of all the nodes in the molecule) and this document is indexed by Lucene. If the RDF Rank weights are used (or an alternative scorer is specified), then the computed values are stored in the Lucene index as a boosting factor that will later on influence the selection order. To use a custom Lucene index in a SPARQL query, use the index’s name as the predicate in a statement pattern, with the Lucene query as the object using the full Lucene query vocabulary. This can be useful when the Lucene query results are ordered in a manner based on but different from the original Lucene score. The luc:score predicate works only on bound variables. There is no problem disambiguating multiple indices because each variable is bound from exactly one Lucene index and hence its score. 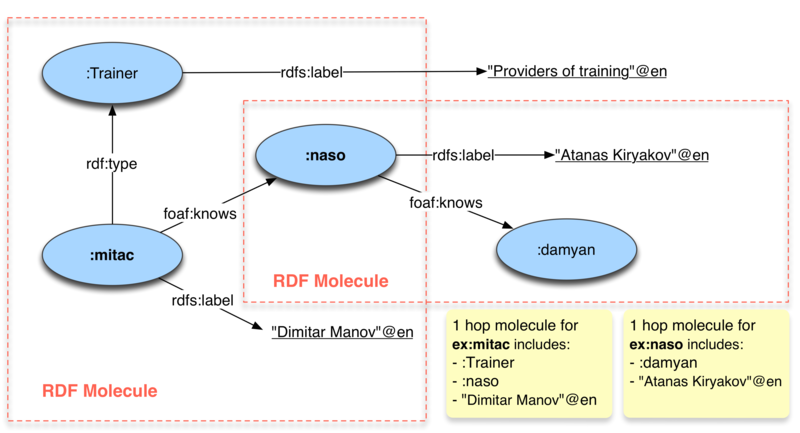 The combination of ranking RDF molecules together with FTS provides a powerful mechanism for querying/analysing datasets, even when the schema is not known. This allows for keyword-based search over both literals and URIs with the results ordered by importance/interconnectedness. You can see an example of such ‘RDF Search’ in FactForge. The following example configuration shows how to index URIs using literals attached to them by a single, named predicate - in this case rdfs:label. ex:astonMT rdfs:label "Aston McTalisker" . ex:astonMartin ex:link "Aston Martin" . <http://www1.aston.ac.uk/> rdfs:label "Aston University"@EN . showing that ex:astonMartin is not returned, because it does not have an rdfs:label linking it to the appropriate text. Each Lucene-based FTS index must be recreated from time to time as the indexed data changes. Due to the complex nature of the structure of RDF molecules, rebuilding an index is a relatively expensive operation. Still, indices can be updated incrementally on a per resource basis as directed by the user. updates the FTS index for the given resource and the given index. Each index stores the values of the parameters used to define it, e.g., the value of luc:includePredicates, therefore there is no need to set them before requesting an incremental update. causes all resources not currently indexed by <index-name> to get indexed. It is a shorthand way of batching together index updates for several (new) resources.